It was an early November respite and I was excited to hike with cheerful friends. It was also a perfect day, not warm and not chilly either. Just the soft, cool breeze that offered welcome relief when the body warmed up from the unexpected steepness and challenges of the hike. We didn’t really know how to go and which way to take towards the Inwangsan Trail. We just decided to meet at Gyeongbukgung Exit 1 and allowed the phone’s GPS to direct us to Inwangsan-gil. 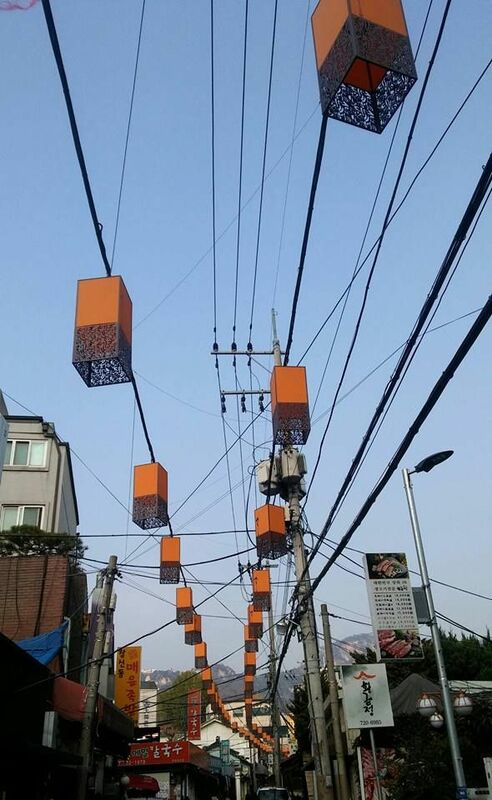 Thanks to these lamps, we knew we were on the right track. And… we found the end of Inwangsan-gil! From this road onwards, we took to laughter and gut-feel as to which way to go. I don’t know about the 3, but in my mind I didn’t expect to reach the peak. We were just there for fun, anyway, otherwise we would have prepared for proper outdoor gear and clothing appropriate for hiking. So, the moment we reached the first top with a steep incline, I allowed myself to fall into the magic of being on top of the world! We reached a Buddhist Temple carved inside big rock formations. We explored the surroundings a little bit and were ready to call the hike done as it was the end of the trail… until we saw a man emerged from somewhere and decided to ask if there is a trail going up the peak. The friendly gentleman nodded and tried to explain the path that we were about to take. He assured us that it was going to be easy. yes, the struggle was real! Armed with no hiking stick, you bet! I resorted to crawling! … Wait, did we say we were going to bring glamour to the mountain, thus the photo with heels? Epic fail, right? lol! I made a mental note that when we go back hiking again, I need to check on good quality trekking poles that would make hiking more easy and fun! I want one with a grip just right for me, with adjustable length and not too heavy. But that was not the end of it. Apparently, it was a steep no-trail trail. If it was just me, I wanted to turn back and go home. I got my photo on top of the hill in my heels, anyway! hahaha! My! Was I glad I had them cheerful 3 and the ajussi angel who told us that it was going to be an easy path up – he ended up helping us through the ropes and the rocks. It was a glorious feeling when we were finally steps below the Seoul Fortress Wall. Victors! The picture tells of no fear. The cheerful 3 had their solo photos standing on the wall while I contented myself just sitting on top of the wall lest I be humpty dumpty and no kings’ men could put me together again. It was exhilarating to be up there. Inwangsan isn’t a very high mountain. 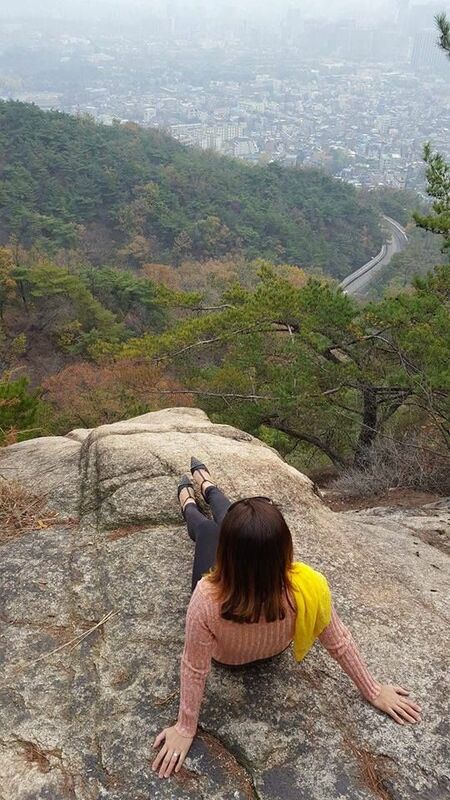 There are more challenging and higher mountains in Seoul where you can relax at the peak. Others set up tents or comfortable hammocks for the ultimate chill. But I love this Inwangsan hike. I’m sure those who have reached it will have their own different and unique stories to tell…. OH MY GOSH ang kulit! How fun! I want to do this with my good friend in Korea when the kids are ready to stay home alone or at least with their grandparents for a day, haha! Thank you for sharing such a fun post! See, the company you keep motivates and pushes you to do the things you wouldn’t have done otherwise. I love that about activities with friends, but I also love hiking and sightseeing alone, so no one makes fun of me taking too many pictures or hiking in heels. Nicely done! I can’t believe you climbed in those heels! That was my first shock when I saw the first image before you even mentioned them LOL. Looks like a great little hike. Perfect for beginners craving a stunning view. I think I’d like to test this out on a winter hike! Kate Carter Hickey recently posted..Happy, Healthy, Fit: Easy Weight Loss Tips! Looked like a fun day! I’m really into hiking, so I enjoy hearing about other people’s experiences out on the mountain. Isn’t it nice to get away from all the hustle and bustle of the city sometimes? It was a perfect timing for me as I was in the middle of preparation for our school’s gala. So, it was a welcome rest:-). IKR? The fortress wall was the easy way up. But it was a good climb, something we can’t forget easily hahahaha! I’d say that was a mislabeled easy mountain! Seems like you did a lot of grunt work to get up to the top! But I love all your pictures and those swirks of blended mineral deposits would lure me up as well! Good for you for not turning back! A great company is always helpful to keep you going, right? I’m glad I was with them. And they like to take pictures, too so it was really a wonderful time. Looks like you had a great day out on the mountain! Nowadays it’s way to cold to hike though 🙁 Enjoy it while you can! Right! Spring time will be welcome. I am not a fan of winter, tooooo cold! Sounds like your hike was a success despite the challenging moments you encountered. I haven’t hiked in a while and I’m itching to get out there before it gets too cold! I can’t do anymore, it’s getting really cold. Will have to wait for early spring. I love hiking in Korea. This looks like a really varied hike with loads to see. Thanks for sharing- will definitely look into this the next time I’m in Seoul! It looks like you had fun! I wanna experience the climb using ropes. Bukhansan and Gwanaksan trails are too easy for me. Thanks for this! I’ll add Inwangsan in my bucketlist! Yes, Karla, it was fun! Especially with great company. Go for it! Great for you that you have already done Gwanaksan. I did a Bukhansan hike with friends but I guess, we were on the easy trail up. I didn’t have time to go up the peak though since I needed to be back home in time for my kids.